Mezze features a mouth-watering collection of Mediterranean and Middle Eastern dips, bites, salads and other small plates to share, to enjoy as appetizers or light meals. An ancient tradition, mezze is the heart and soul of modern culinary life in Turkey and the Middle East. The word mezze (meze in Turkey and mazza in Syria and Lebanon) is thought to have derived from the Persian maza meaning taste or relish which is exactly what is something tasty designed to be savoured with a glass of tea, wine or beer, a fruit sherbet, or a yogurt drink with the aim of pleasing the palate, not to fill the belly. At its simplest, mezze can be represented by a bowl of gleaming olives marinated in lemon juice and crushed coriander seeds, or a mixture of roasted nuts and seeds tossed in salt and dried thyme. At its most elaborate, it can be presented as an entire feast comprising a myriad of little colourful dishes, each the bearer of something savoury or sweet but always utterly delicious. 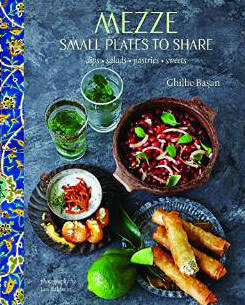 In this book, youll discover such exciting recipes as Purple Carrots and Saffron Pears; Savoury Pastries filled with Feta and Herbs; Cinnamon-flavoured Meatballs; Aromatic Stuffed Mussels; Parsley and Bulgur Salad; Refreshing Cucumber Strips sprinkled with Salt; Pan-fried Halloumi dusted with Zaatar; and Velvety Yogurt and Sweet Helva nothing quite beats the magic of mezze.